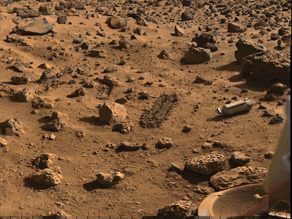 This image from the surface of Mars offers some proof Kilroy's robot was there. Note the trenches where Viking was scooping dirt for analysis and the hermetic cover for the scoop. One thing you don't want to do is bring a contaminated shovel to another planet. You might find life – and discover it came from Merritt Island, Florida. Or worse yet, I supposed you could pull a reverse Andromeda Strain. Join Miles this Sunday at 7pm Eastern for an hour-long LIVE special on the next Mars landing. Good pics! a great man once said solutions to problems may not sometime be found in the mere answers but rather by the questions asked. The previous photo shows tracks from a previous NASA craft on Mars proving a craft was there on the red planet. Why haven't NASA been back to the moon, it is a lot closer than Mars? Why won't NASA just send a Mars rover and rename it a Lunar rover for the specific mission to the moon? What evidence will it show just as the previous pic on this article suggests? – what is the smallest size rock that can be imaged by MRO ? – does Phoenix robotic arm have the ability to assist with the deployment of the solar panels if they dont fully deploy ? Why didn't the remote vehicle take a half liter or a vial of water there and open or break it infront of a camera and see what would happen..? Something to consider while building the next robotic vehicle for Mars. > and open or break it in front of a camera and see what would happen..? It would freeze. The average temperature in Mars is something like -100 degrees. When/if humankind goes to Mars, we (well, our great grandchildren) will have to increase its temperature. It will take more than a century, but the good news is that we already know how to warm up a planet: we already did it to one. > the Worlds” (remember, the Martians invaded Earth in search of water). According the Wikipedia, the canals (or channels) are not mentioned in the War of the Worlds. > can used the money and resources to build a better planet on earth. > What is wrong with the world…. Tell that to Marcopolo, Columbus, Magellan, etc., etc. First, you have a communist view of the economy. The resources are fixed (that is your mistake number one), and your next logical step is to take them away from people that have too much. Next, do you have an idea of how many jobs, progress, knowledge are produced by these explorations? Last: we are running out of planet. Like any inhabitant of an island will tell you. There are more Greeks, Puertoricans and folks from the Canary Islands outside their birthplace than inside. Some of your descendants will have to move. The earlier we start preparing, the better. If you want to see budget reductions, look elsewhere! we already did it to one. Thanks for the answer, yet i don't believe in Global warming. I belive our planet is going through a global shift with the rise of the earth crust of new earth pushing higher. Through scientist study of methane gas prove than this has happen more than 10,0000 years ago.